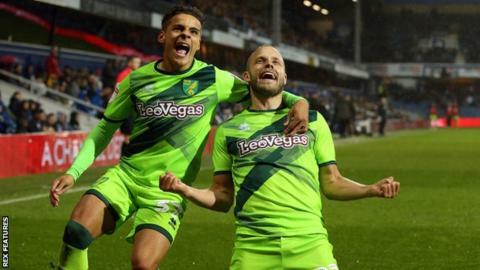 Norwich City recorded a third successive Championship win as Teemu Pukki's second-half goal was enough to beat Queens Park Rangers at Loftus Road. The Finland international chested in Marco Stiepermann's cross from the left wing on 71 minutes to net his fifth goal in as many games for club and country. Rangers came close to an equaliser when Luke Freeman's powerful effort from distance was tipped over by Canaries keeper Tim Krul, while Eberechi Eze fired wide from outside the box. The west Londoners had taken 10 points from four games heading into the match but Steve McClaren's side suffered their fifth defeat of the league campaign despite putting the visitors under late pressure. Norwich had gone eight months without an away win in the Championship but now have two in the space of four days, adding to their victory at Reading in midweek. Daniel Farke's men bossed possession and almost went ahead midway through the first half when Pukki was inches away from getting on the end of Jamal Lewis' low cross. Pukki's fifth league goal of the season was a good piece of improvisation as the in-form striker diverted the ball past R's keeper Joe Lumley from 10 yards out after Stiepermann's ball in had flicked off Toni Leistner. Rangers rarely tested Tim Krul in the Norwich goal, with the Dutchman making a routine save from Nahki Wells just before the break. Match ends, Queens Park Rangers 0, Norwich City 1. Second Half ends, Queens Park Rangers 0, Norwich City 1. Attempt blocked. Luke Freeman (Queens Park Rangers) left footed shot from the left side of the six yard box is blocked. Attempt saved. Jordan Rhodes (Norwich City) left footed shot from the centre of the box is saved in the top centre of the goal. Assisted by Todd Cantwell. Attempt missed. Tomer Hemed (Queens Park Rangers) right footed shot from outside the box is too high. Assisted by Eberechi Eze. Attempt missed. Bright Samuel (Queens Park Rangers) left footed shot from the right side of the box misses to the left. Assisted by Tomer Hemed. Attempt missed. Teemu Pukki (Norwich City) left footed shot from the right side of the box misses to the left. Assisted by Marco Stiepermann. Substitution, Queens Park Rangers. Matt Smith replaces Toni Leistner. Corner, Queens Park Rangers. Conceded by Jamal Lewis. Corner, Norwich City. Conceded by Jake Bidwell. Attempt blocked. Timm Klose (Norwich City) header from the centre of the box is blocked. Assisted by Moritz Leitner with a cross. Moritz Leitner (Norwich City) wins a free kick on the right wing. Attempt missed. Eberechi Eze (Queens Park Rangers) left footed shot from outside the box misses to the right. Assisted by Tomer Hemed. Delay in match Tim Krul (Norwich City) because of an injury. Corner, Queens Park Rangers. Conceded by Tim Krul. Attempt saved. Luke Freeman (Queens Park Rangers) left footed shot from outside the box is saved in the top left corner. Assisted by Jake Bidwell. Substitution, Queens Park Rangers. Bright Samuel replaces Josh Scowen. Substitution, Queens Park Rangers. Jordan Cousins replaces Alex Baptiste. Corner, Norwich City. Conceded by Alex Baptiste. Attempt missed. Massimo Luongo (Queens Park Rangers) left footed shot from outside the box is high and wide to the left. Assisted by Eberechi Eze. Goal! Queens Park Rangers 0, Norwich City 1. Teemu Pukki (Norwich City) with an attempt from the centre of the box to the bottom left corner. Attempt missed. Toni Leistner (Queens Park Rangers) right footed shot from the centre of the box misses to the right. Assisted by Luke Freeman with a cross following a set piece situation.